Since the husband didn’t get new garb last year (ah, pregnancy), I decided to give him the works this year. The PARF’s theme is an Italian visit, so he’ll be donning the full MA ensemble, flavored with Italian seasoning. Shirt – His old shirt has seen a lot of wear, and isn’t classy enough for the fabrics he’ll be wearing this season. The shirt is being done in white cotton broadcloth (I really didn’t have the patience to wait for linen to go on sale) and will have blackwork at the cuffs, collar, and edging along the ruffles. I plan to pleat the ruffles–I know, fancy! This is my first attempt at embroidery, and I’m optimistic. 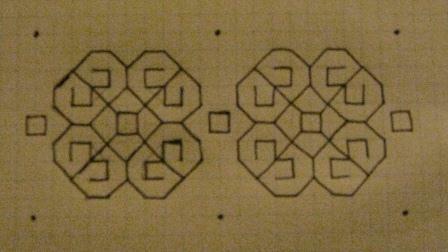 The first picture is the original design that the husband picked out. The second picture is the design reworked to fit the shirt pieces. The third picture is the first completed cuff, which took about three hours. 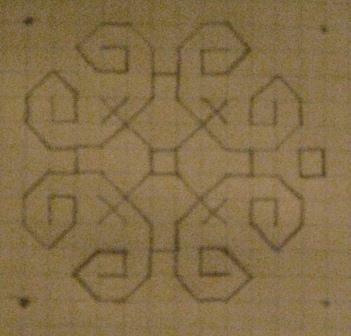 Again, this is my first attempt at embroidery, and it took three tries to figure out the best route through the design. Now, I have it down to one main thread with six threads for the tiny boxes. I also did the neck gussets, which I might scrap, depending upon how they look when the collar is done. UPDATE: It’s done, and I love the results. I have a lot to learn about embroidery, but this was a good start, in my opinion. Slops – The layers from inside out: lining in bleached muslin, base in heavy green cotton, underlay in green taffeta, center front and back panes and leg bands interfaced with medium-weight fusible, side panes (8 each leg) and waistband flat-lined with unbleached canvas. The main fabric is black cotton corduroy, blended 95% to 5% with spandex. *Here’s a tip: That 5% matters when you’re doing embroidery, especially when you’ve replaced your wovens needle three times, broken the metallic thread seven times, skipped an innumerable amount of stitches in your scallop stitch, and still have 17 1/2 panes to stitch. I almost decided to redo the first 2 1/2 panes in green thinking it was the thread’s fault. I also tried stabilizing two panes, thinking that would help. I had already calculated how many packs of new needles I would need to pick up, based on the rate that I was dulling the new pack I had. When I was at my wits end and tried a knits needle instead, I didn’t skip another stitch. The design on these pants was made possible by the sewing machine fiasco of 2011. Up until I got the new machine, I didn’t actually know how the slops were going to turn out. Originally, I’d planned to use green embroidery down the center, but I wizened up and went with silver only for each pane. The hardest part of the pants was the suggested gathering of the panes to the base/underlay. I ended up pleating them in place. Yes, it’s more time-consuming, but I feel like it’s easier to handle, especially when I have to stitch it all down. 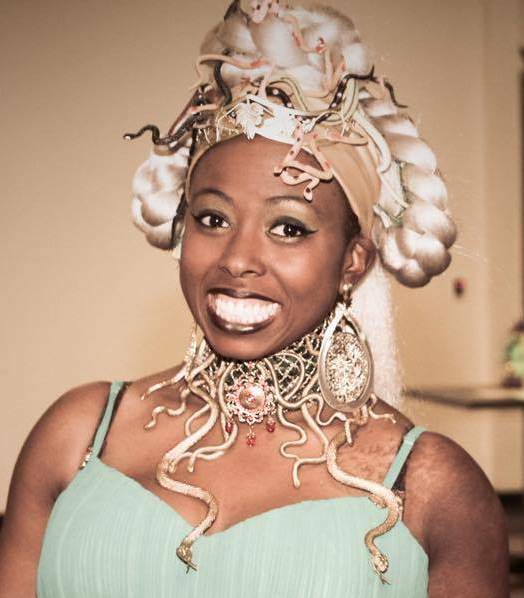 I don’t get uneven gathers that I’m normally plagued with. I stuffed the legs with stiff black netting. It was a little crunchy and unwieldy, but the slops hang nicely. I was concerned with the length; as usual, I had to lengthen at the crotch because the husband has a long torso. I had planned to tighten the leg bands, but never got around to it. 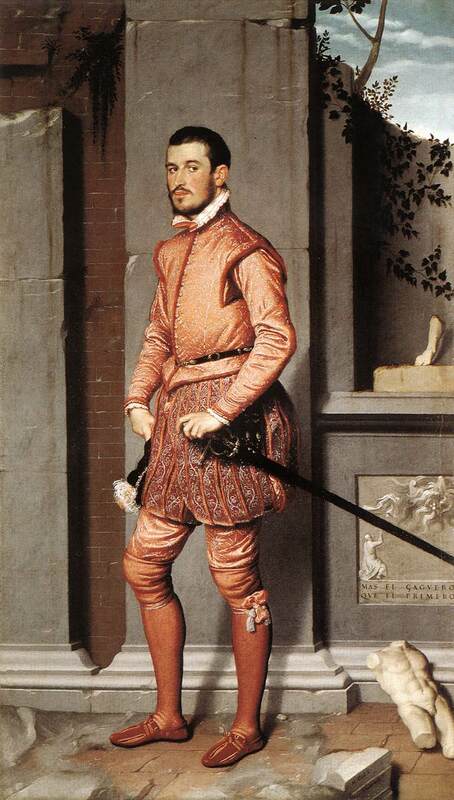 Codpiece – I’m going to make this one short. Construction was easy, but I won’t make this one again. The shape is odd. I’m not saying that it needs to be anatomically correct, but it should look more like a phallus than a filet mignon…just go with it. 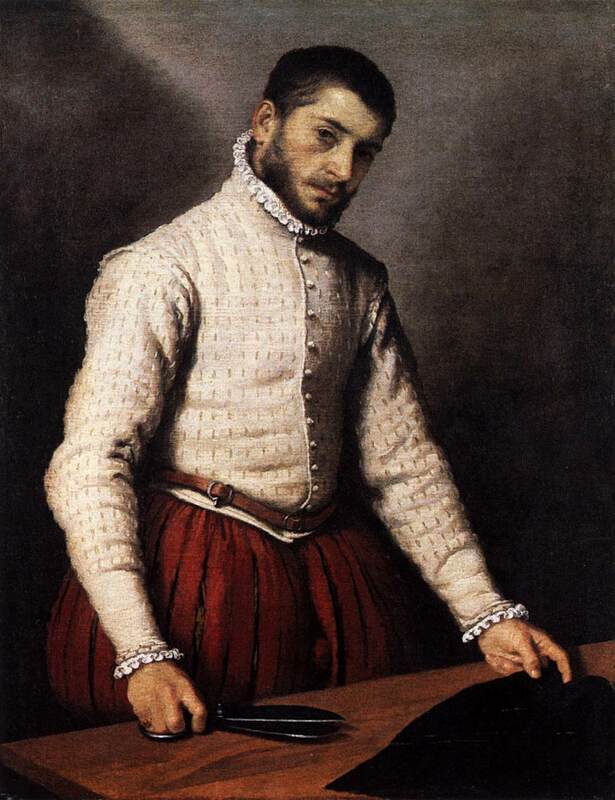 Doublet – One day, I will get this fitted perfectly. Until then, it wasn’t so short that I couldn’t make adjustments. In the beginning, the doublet was supposed to have no waist treatment, but when I thought it was done, I realized that 2 inches of extra length would have been better than 2 less than 3 inches of length, which I’d originally given him. I was tired and sleep deprived, and it made sense at the time. 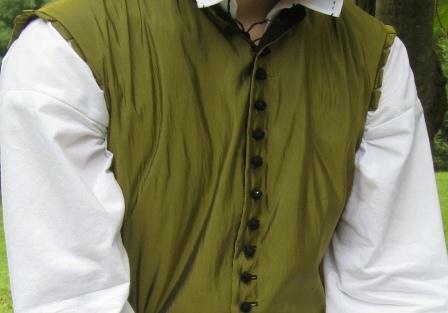 The doublet is lined with black cotton, flat-lined with heavy green cotton, and the fashion fabric is the same green taffeta from the slops underlay. Merging sizes always screws up his collar, and I’m convinced that he’ll never have a collar that he can button comfortably. Since our primary faire starts in August, he doesn’t mind. For the collar and shoulder treatments, I went with short tabs, and I love them. I guesstimated the size that would look best, added a short seam allowance and started cutting and serging. After turning each rectangle with my little finger and pushing out the corners with a small ruler, I basted them to the doublet, stitched in the lining, and pressed everything out and down. The result was exactly what I wanted. The tabs have no lining, flat-lining or interfacing. I made the thread-wrapped buttons from plastic silver beads and black embroidery floss. That was easy to learn and I can’t wait to experiment with varying color schemes for the next project that needs buttons. 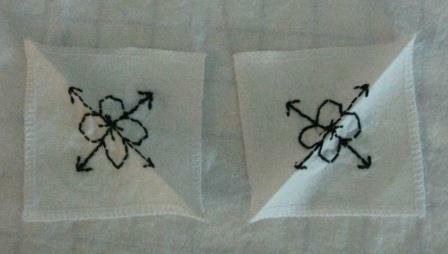 The button holes were stitched on the machine with the buttonhole foot. The stupid button kept jumping out of its little cage, but the speed with which the machine finished the set made up for it. Plus, I realized that the button didn’t need to be present after the initial measuring to make the holes. I love my Brother. 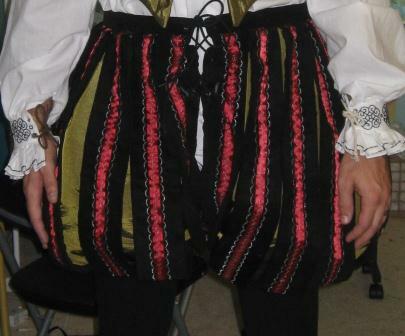 After I got to the “end” of the doublet and realized that it was too short, especially with the hopes of including an eyelet strip for tying up his slops, I added skirting. 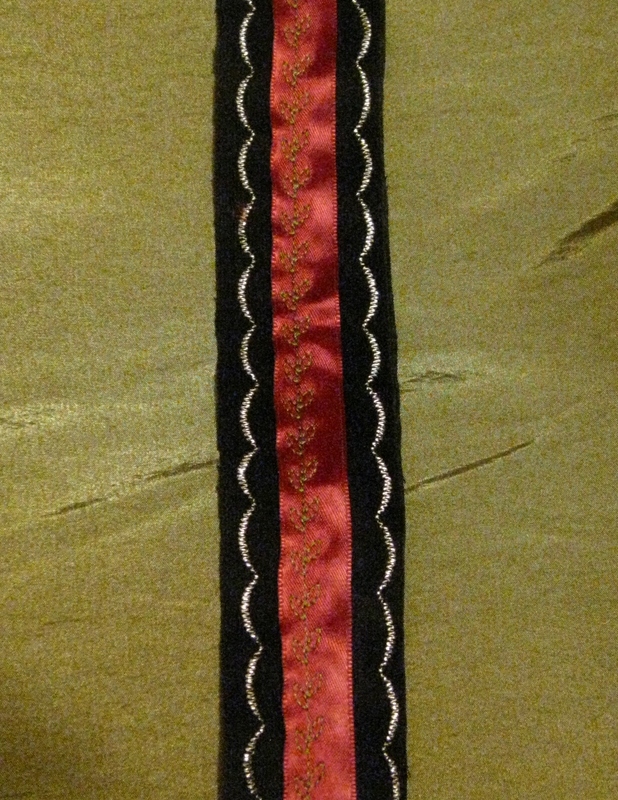 Since I wasn’t about to slipstitch the whole lower edge, I made the skirting and eyelet strip separately and stitched them together to the bottom of the doublet with a 1/4 inch seam allowance. It was touch and go, but no needles were harmed. I added the corresponding eyelets (small silver) to the slops waistband and used black macrame cording to tie them. I don’t have a picture, but, I promise, it’s easier to tie the pieces together than fixing shifting clothes all day. I didn’t leave enough time for his hat, so his only accessory was a faux leather belt from which he hung a black pouch. Unfortunately, the belt is, essentially, bias tape, so I’ll need to give it a canvas core to make it sturdy. It was fastened with a silver clasp. He wore black tights and shoes. 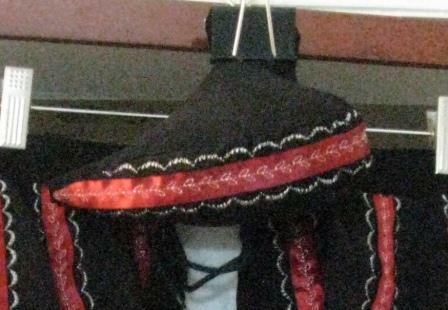 The doublet has no sleeves yet, but they will be taffeta as well. 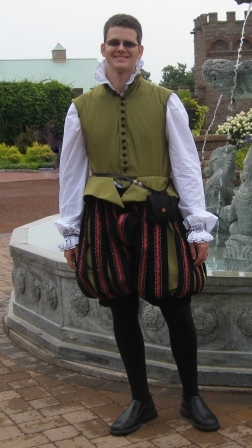 I would also like to make a black jerkin and half cape to wear over the ensemble, but that will largely depend upon what our cool weather faire plans become. In all, I loved him in this outfit. The process is never perfect, but he always looks dashing in the end.